The latest show at ART is Red Herring, a NW Premiere by Michael Hollinger, directed by OSF’s Christopher Liam Moore and designed by long-time OSF designer, Richard L. Hay. It plays in their small theatre, which is located at SW Alder & 16th Ave., and runs through March 17th. For further information, contact them at www.artistsrep.org and/or call 503-241-1278. It was the 1950’s, not the best of times, nor the worst of times. Like a spicy stew, it had the H-bomb, film noir, the Red Scare, blacklisting, the Iron Curtain, Mickey Spillane, G-men and spies. All the ingredients for a very dark trip down the intricate and winding path of human foibles. But it also contained IKE, soap operas, Ozzie and Harriet, cars with fins, Rogers & Hammerstein, and the American Dream. In Red Herring, we enter this comic strip world, for better or worse, till the 60’s do we part. The plot has many of the above mention devices. Once upon a time, there may have been a heroic, G-man, named Frank (Leif Norby), who fell in love with his partner Maggie (Val Landrum). Into this world there also may have been two young lovers, a naïve young girl named Lynn (Amy Newman), who would do anything to win the man she treasured, James (Joshua J. Weinstein), a budding physicist. But there may also be dragons, in the guise of a mysterious landlady, Mrs. Kravitz (Vana O’Brien) and her equally intriguing husband/boarder/partner (? ), Andrei (Michael Mendelson). But the fairy tale journey becomes a bit more rocky, as we discover that Frank’s main squeeze, Maggie, has a checkered past. Or, that the young lovers are not as pure, or as patriotic, as we assumed. And that the dragons may have a “pinker” tint, as they search for a “cheesey” solution that may just bring down all the kingdoms. In other words, things are not as they seem. And, that the layers of love, deception and compromise are, indeed, a many tangled thing. To tell much more of the intricate plot might spoil the story. But, let me conclude this part by advising that the term “red herring” could be a fish but, in storytelling, it is, in short, a false clue. Enough said. The play is labeled by the author as a “fable about marriage.” It also has elements of a spoof…and a farce. In short, the main stumbling block on this intriguing highway is deciding what genre it is. If it is a farce, it should be played more broadly by the cast, like a Moliere play. If a spoof, it is a subtler comedy, and should have elements of nostalgia, of homage to an era, like High Anxiety. If a fable, I would expect a storybook setting, as in Sleeping Beauty. The actors and director strive mightily to find the happy medium. The acting is wonderful throughout. Ms. O’Brien (a long-time, local veteran of the stage) seems to have found the right mix of humor. Whenever she’s onstage, you are watching her. She plays an assortment of characters, all of them spot on. And Mr. Mendelson (another veteran) is super in all his incarnations and accents. He is equally adept at playing the broader humor of the play. Ms. Newman has very much the right look for the part. And her other composite characters are also well portrayed. Mr. Weinstein is adept, too, at changing his demeanor for his other stage selves, especially good as the priest with dueling confessors. Ms. Landrum has the right look and sense for her character and plays it with determination. But, as written, her character seems a little out-of-step with the view of women in the 50’s (aka, the happy homemaker, Donna Reed). And Mr. Norby (also a veteran) definitely has the right look-- steely-jawed--and manner of the hard-boiled detective of that era. He plays it with all the bravado and conviction of the male ego of that period. The inventive direction by Mr. Moore keeps the play moving but without sacrificing the understanding of the story. And, hats off to Mr. Hay, for his very elaborate, and yet simple set. It is essentially a bare stage with lots of little nooks and crannies to mask and expose, as needed, the various elements of the locations. And the coloring looks like B&W line drawings from a comic book of that era. Bravo, Mr. Hay, you’re extraordinary! I would recommend this show. If you do go, please tell them Dennis sent you. And, a side note, you should not miss their next show, The Gin Game, a two-character play, which has the impeccable acting talents of Allan Nause and Vana O’Brien. RENT—Clark College, Decker Theatre—Vancouver, WA. This award-winning musical is written by Jonathan Larson and directed by H. Gene Biby. Musical direction is by Jonathan Quesenberry and Choreography by Lisamarie Harrison. The college is located at 1933 Fort Vancouver Way. 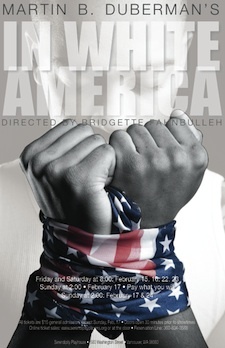 For further information, contact them at www.clark.edu The play runs through March 9th. This highly touted, and often produced Rock Opera, covers a year in the life of eight very individualist characters, representing many aspects of New York society. But this world is not located in the condos or penthouses of the rich, but focuses on the underbelly of the City in East Village. Humans, out-of-work and out-of-luck, but with a fierce will to survive, even in the most inhumane of situations, the slums. It is the world of drugs and aids, of struggle and loss, of love and, yes, even of hope. Tennessee Williams is, in my opinion, one of America’s best playwrights. And most of his plays have a relationship to other plays/characters of his, as well as his personal life. And so it is with the plays presented here: Something Unspoken, late 1930’s Mississippi, directed by Scarlett Clark (directing debut); The Long Goodbye, late 1930’s St. Louis, directed by Gian Paul Morelli (Executive Director of Columbia Theatre); and The Purification, the Southwest, directed by Donald A. Correll (Producer of Center Stage). This “Scottish Play” by William Shakespeare and directed by Orion Bradshaw will play through March 17th at 7 pm. The space is located at 850 NE 81st Ave. For further information go to www.postfivetheatre.org Best get there early, as there is only street parking and it’s in a residential neighborhood. 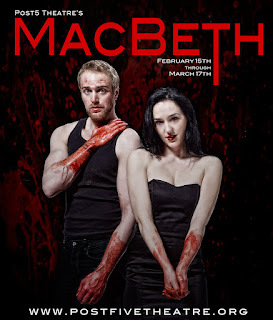 Macbeth, or “The Scottish Play” (because the title will bring bad luck, if uttered in a theatre), is one of the shortest of Shakespeare’s plays and one of three steeped heavily in the supernatural (the other two being A Midsummer Night’s Dream and the Tempest). It is also being performed in a “black box” theatre, meaning it is stripped of its pageantry and must rely, almost solely, on the text and actors. A shaky premise in untalented hands. But, no fear, what we are witnessing here, is a group at the top of their game! It is the classic story of greed, ambition, and revenge and is copied, in some form, in many of the plots today for film and theatre. Macbeth (Ty Boice, the theatre’s Artistic Director) is a middle-management warrior, secretly desiring to be King. His wife, Lady Macbeth (Cassandra Schwanke, Founder of HumanBeingCurious production company), is more than willing to egg him on, in this unseemly dream, in practical ways. And when the King, Duncan (Brian Harcourt) and his minions just happen to visit their castle, the plot’s afoot to murder them and set himself up as the top dog. But deceit has its own curious bedfellows in the guise of paranoia and guilt. He begins to suspect that everyone, including his best friend, Banquo (Nathan Dunkin) and a fellow Thane, Macduff (Jonah Weston) and their families, are also after the Crown. Add to this, the three “Weird Sisters,” witches (Ithica Tell, Melissa Whitney, & Nicole Accuardi) which promote (or warn) him toward/of his future. The solution to the puzzle seems simple—kill them all. And, all that it will cost in the end, is his wife’s sanity/life and his own head. This production, as stated, is devoid of any of the usual trappings of a period piece. It is done in modern dress, mostly in black and white costuming and, essentially, on a small, bare stage with minimal props. The understated, but effective, sound effects, is a rumbling (perhaps, of thunder) at climatic moments and a faint tinkling of bells when his dagger of the mind “appears.” Also one of the walls takes on a human-like appearance at one point. All to enhance but not detract from the story. The witches have the most elaborate costuming/make-up (McKenna Twedt). They look like a cross between zombies and the ghostly demons from the Japanese Grudge/Ring horror films. Pretty scary, very effective and well performed. One can expect this show, per the subject matter, being bloody, but it is not overused. And the fight scene at the end is well staged by Sam Dinkowitz. The direction by Mr. Bradshaw is spot on. He keeps the play moving at a rapid pace but not so fast that we lose the story. He keeps it simple but to the point and seemingly allows his actors to explore the intricacies of the characters, as well as letting the audience form their own viewpoints as to the meanings. I hope to see him direct more productions but he should not forget his talent as an actor, either, having given an outstanding performance as Puck in their “…Dream” last summer. It is grand to see Mr. Boice once again onstage (appeared as Prince Hal in their Henry lV, Part 1. Begs the question, though, will he grace us with his Henry V sometime?). He has tremendous power as Macbeth but I particularly like his quieter moments, when you observe him thinking, weighing in his mind, the options presented to him. This is an actor who goes full force forward in his character interpretations and it is exposed splendidly on “the boards.” If this is a sample of things to come for their group, count me in! Ms. Schwanke, as his lady, is beautiful in her physical form but equally beautiful in her evil intent. Can one be attracted and repelled, as well, by the same person? In her, you can. She is the Beauty and the Beast, as one, in her Lady Macbeth. She seduces, she schemes, and she is unstoppable in her ruthlessness. Cassandra is glorious in all these guises. And she is equally effective as a leader of her own company and director of their Tempest, earlier this year. (See my reviews of both their companies’ shows elsewhere in this blog). Philip Berns as Seyton, chief henchman for Macbeth’s horrible deeds, is steely in resolve to succeed in his duty, no matter how unnatural. He draws your attention to him every time he’s onstage. He’s been touted in my past reviews as a shining example of the old theatre adage, “ There are no small parts….” The only comic scene in the play is led by the character, the Porter, well-played by Keith Cable. Mr. Weston, as Macduff, plays him like a graveled-voiced, Sicilian from some gangster film and he’s very effective. As is, Mr.Duncan, as the bloody Banquo. And Ms. Twedt, as Lady Macduff, makes the most of her one brief scene and is good in the other two roles she plays (as well as Costumer for the show). I highly recommend this show and their company. Their new black box theatre is super. They are the best in this area for mouthing the verse “…trippingly on the tongue,” and making it understandable/conversational. If this be the Future of performing Arts, “…play on.” This is an in-your-face production, so be prepared, as it may not be for everybody. If you choose to see it (and, I hope, you will) please tell them that Dennis sent you. This production is written by Martin B. Duberman and directed by Bridgett Fahnbullah. The theatre is located at 500 Washington St. This show plays through this month. For further information, contact them at www.serendipityplayers.org or call 360-834-3588. This play is proudly presented as part of the celebration of African-American History Month. It is a Documentary play and all the words spoken are from actual transcripts from the people involved. It covers from pre-Civil War up to the mid-50’s in a story that lasts a little more than an hour. At the end of this presentation, local Black presenters share their stories of growing up in White America. The play, although powerful, barley scratches the surface of the approximately 100 years that it covers. But the marks that are made are deep, and demand from the viewer/listener, more investigation to get the complete story. Many familiar names appear including Lincoln, Fredrick Douglas, Sojourner Truth, Jefferson, Nat Turner, John Brown, Booker T. Washington, E. B. Dubois, and President Wilson, to name a few. But there are so many unnamed and unheralded, too, that laid the foundation for Freedom. Who are we . . . really? 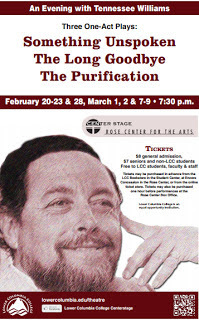 This show will be performed at PSC in their studio theatre until March 10th. The theatre is located at 128 NW 11th Ave. (in the old Armory) in Portland. It is written by David Ives and directed by Nancy Keystone. For further information on their Season or tickets, go to www.psc.org or call 503-445-3700. This is a two-character, highly intense, story (with no intermission) concerning, in short, the relationship between genders. Specifically, it is from the pen of an 1870’s writer, Sacher-Masoch (where the term sadomasochism comes from, along with the author, De Sade). From that, you may be able to glean some of the content of the story. The pedigree of two-character lead’s (a man and a woman) tales, dealing with multiple identities and settings, is an impressive one. The early 1900’s gave us some European one-acts, The Lesson, regarding an abusive relationship between a student and teacher, as well as later, Mamet’s, Oleanna, and Strindberg’s, Miss Julie, dealing with issues of class, and servant/master relationships. And, there is Vonnegut’s, Who Am I this Time?, dealing with actors who only become relevant when they are on-stage and Tennessee Williams’s, Outcry, where relationships and situations become murky. The film, Closetland, having to do with secret identities/selves is in this category and even an old W/B cartoon, with Bugs and Elmer, changing characters, as a wind blows various hats and costumes onto them, which they inhabit. Perhaps Shakespeare had it right: “We are such stuff as dreams are made on…” or “All the world’s a stage, and the men and women, merely players….” Within these limitless boundaries, anything is possible. And Venus In Fur explores a small piece of this universal pie, the very fabric of our being. As said, who are we…really?! On the surface, the story is about a struggling writer and first-time director, Thomas (David Barlow), attempting to cast a play he’s written. Into this rehearsal space, auditions long over, charges in Vanda (Ginny Myers Lee), dressed in black leathers and metal, ready for her chance at the elusive stardom. The play he has adapted is of the name and author, mentioned above. Reluctantly, he gives her a chance and the reading begins. As they become enveloped in the reading, the lines between their roles and their “real” selves begin to blur. Reality and Fantasy begin to intermingle and interchange. The abuser becomes the abused; the master, the slave; even genders shift. There can be no happy ending for this nightmare but, I guess, it depends on your definition of “happy” and even, “nightmare.” Reality may be in the eye of the beholder and, if two realities collide, can they both survive? If so, what would that world look like? Multiply that, by the number of people on this earth, and it just might equal…Chaos. The script, by Mr. Ives, is an intriguing study into human relationships. It is a gripping tale but always has, at least, one foot grounded in the real world, that is, until the end. Then it throws out that premises and falls into the Absurdist genre. No, I won’t reveal the twist ending, but it comes off more silly then profound. It’s as if the creator of this piece had painted himself into a corner with no way out. But, until then, it’s a fascinating exercise! The performances are unbelievably good! Mr. Barlow (a ringer for Rob Lowe) is at his best in the thoughtful moments, as you see him listening, considering and acting on the events as they quickly take place. He is totally convincing in the role. And Ms. Lee, as the actress, is astounding! She shifts from one character to another and then, a third, with such ease, you think it is a different person onstage. She is so convincing as she reveals such conflicting stories as to who she is and how she knows the things she’s saying that, in the end, you really don’t know what to believe. An amazing, sustained performance in a tension-filled play from each of these professionals. Bravo, cast! Ms. Keystone must also be commended for the vision and interpretation of this story with its many twists and turns. The pacing is rapid but the audience is in her, and the cast’s, grip at every bend in this winding road. I recommend this show, but with reservations as those offended by the subject matter or strong language. If you do go, tell them Dennis sent you.